Update, April 2015. See bottom of post....Over the years we have often used Moeller Marine products, also sold under Tempo, and found them to be of fairly decent quality. But our most recent purchases have changed our opinion considerably. Here on the Beach House site we often post the specific product we are working with and links to where it can be found. When we use a product we like, it gets a good mention and we will often recommend it to others. But when we find a product we consider of poor quality we feel just as obligated to let others know of our experience. Three recent products made by Moeller have made our "Never Again" list. We haven't been totally neglecting Beach House, but W-O-R-K has been interfering with our boat work a little. Our new projects for Marinalife are coming along nicely. We have quite a few Navigational Notices and Alerts posted that cover the eastern U.S. coast from Maine to Florida and the Gulf Coast, Great Lakes and inland Waterways that include the Great Loop Route. We have even posted a few from the west coast, but not as extensive as the rest. We are also putting together cruising itineraries based on some of our previous cruises that include marina stops and anchorages for a leisure cruise south on the ICW, with stops at about every 50 miles. We will have another cruise template for the ICW from the Georgia border to the Florida Keys, but that will probably not be up for another week. 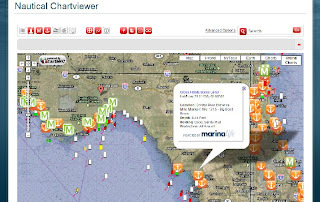 If anyone wants to receive my Navigational Notices, you can go to the Marinalife website and register, and then sign up for whatever areas you want on your dashboard page. It is all free and I send out the Notices as soon as I receive and verify them. They can be read on the website or sent right to your email box. The notices are also linked to our Nautical Chartviewer so you can see the exact area where the notice is posted.